North America Forum»Forum ›League of Angels-Fi... ›Bugs & Support › World Chat Bug on Nightblade (S6). 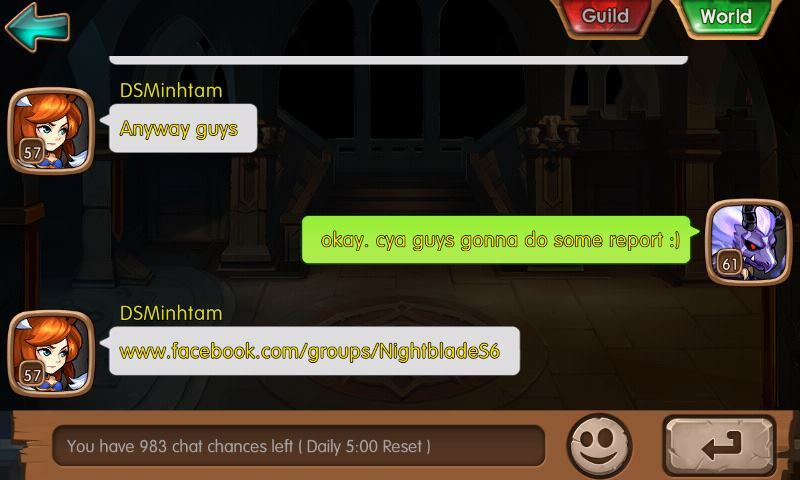 World Chat Bug on Nightblade (S6). Hi. ;This is IGN DSMinhtam from Nightblade (S6). A fellow player and I may have discovered a bug in world chat. ;This player recently took issue of how i was ignoring his messages in world chat, and as of today we now know the reason why. ;He can see my messages, but I cannot see his. ;We have found that this extends to other players too, where I am talking to other players that he does not see in the world chat, just as I cannot see him on world chat. I can see this being a big problem because we talk quite a lot in Nightblade (S6), to the point where I am making announcements quite often. ;If this issue can be resolved as soon as possible, we would gladly appreciate it. ;Let me know if you need any more info. if you need more photos to prove of this bug please notify us we will dig into it with the help of other players. Hi, it\'s quite rare, did both of you try to quit and re-enter the game? If the issue still exist, please let me know. According to VonnEinhard, this issue has been happening for weeks, and with multiple players, not just the two of us. 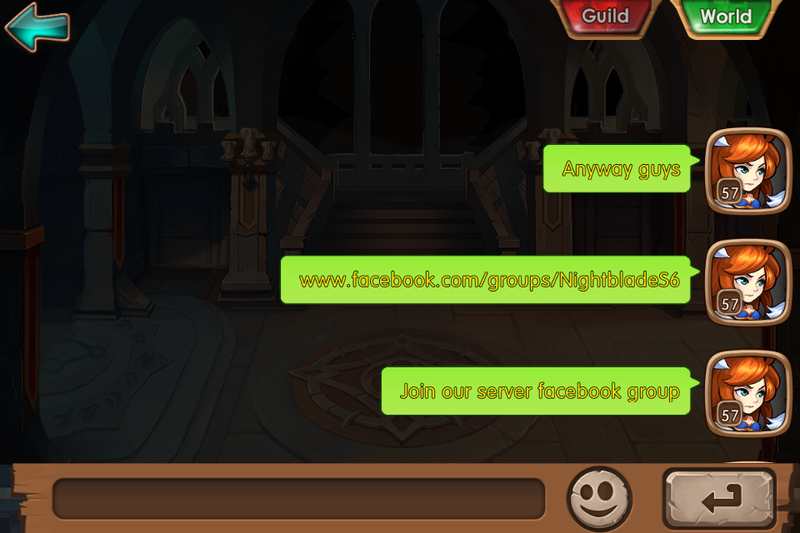 ; And quitting/re-entering doesn\'t exactly help, since the game does not load past messages of World Chat anyway. I\'d have to assume, then that this is a universal issue among all players. 1. Does this issue always exist from the beginning between both of you? Or it suddenly appears? 2. Does this issue still exist after reloading? Did you run a test after reloading? 3. Have you ever heard anyone mention the same issue, or it\'s just assumption that someone else may experience the same situation? 1. Clearly this issue did not always exist from the beginning, as VonnEinhard and I were able to communicate at one point. ;But there have been several times where VonnEinhard has attempted to talk to me, but I don\'t see his messages at all, which forces us to talk on Facebook. 2. We did run a test after reloading. ;Same problem. 3. Yes, other members have mentioned the same issue once I have pointed it out, and I\'ve done several off-key tests where I ask people to type in my name if they can see the messages I write, and several of them do not respond. ;The members of;server 6 will conduct an official test sometime this week or next, and I will post photo evidence of the results to confirm that this is a universal issue. We can provide some more photos if you want us to. It\'s kinda annoying that you don\'t know who\'s talking to you and your talking to someone else and they don\'t care at all cause they can\'t see your post. Hello. Just an update, but a handful of players on our server will be conducting a world chat test tonight, to confirm that the issue is universal. Also, I switched my IGN. 2019-4-20 14:59 GMT+8 , Processed in 0.064526 second(s), 52 queries .